You’ll look polished and put-together when you don this stylish nautical-inspired jacket. The Black and White Crossover Sailor Jacket has a crossover front and two vertical rows of silver buttons. The ivory background and horizontal black stripes create a fun summer look when paired with a black tank top. Three quarter length sleeves keep this jacket looking light and summery. The Black and White Crossover Sailor Jacket would look great paired with denim and heels or flats. You could also wear it with black cigarette pants or dress pants for a dressier look. This is a jacket that can be worn many ways. Black tank top not included. 95% polyester, 5% spandex. Dry clean or hand wash cold. Do not bleach. Hang or flat dry. Small measurements: Length from top of shoulder to hemline: 22”. Bust: 32-34”. You have added Black and White Crossover Sailor Jacket into Wishlist. 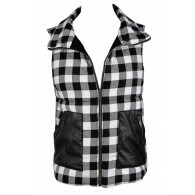 You have added Black and White Crossover Sailor Jacket for Stock Notification. 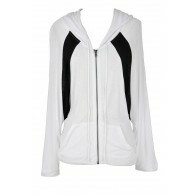 You have set Black and White Crossover Sailor Jacket as a loved product. You have removed Black and White Crossover Sailor Jacket as a loved product.